So you made the plunge to a glass sandwich phone. Or, alternatively, design trends forced you to settle for one. Regardless, you might as well benefit from any forgone convenience and sturdiness and get a Qi compatible device. After all, the thought of one less cable crowding up your desk and life in general sounds universally appealing. And as luck would have it Gaze Lab has an interesting proposition in the Gazepad Pro. 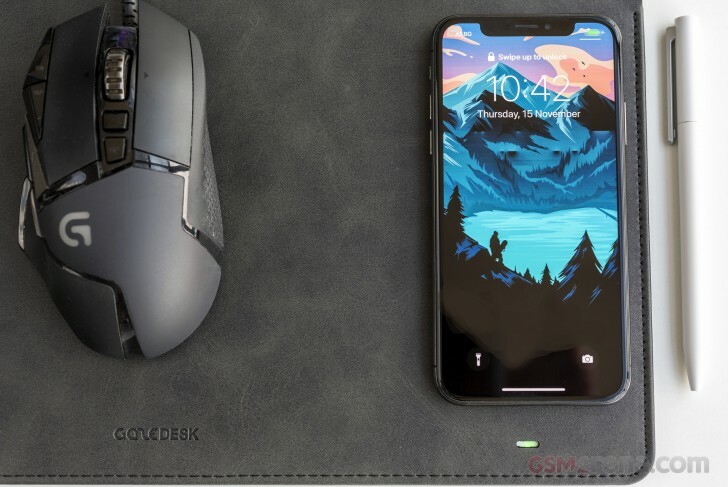 Why not get a Qi wireless charger that can also double as a mouse pad? And a very premium one at that. Save even more space and move one step closer to a clean and simplistic desk setup. Sounds pretty great, which is why we took Gaze Lab up on the offer to give the Gazepad Pro a try and see how well it works in real life. Right off the bat we note that the Gazepad Pro unit we received looks pretty hand-made. You can feel a tiny bit of give here and there, pressing on the surface. The areas around the Type-C connectors also have very small imperfection near the edges. The stitching that goes along the edges also looks like it was made by a human, rather than an assembly line. We are unsure if that's only going to be the case with our review unit, which was after all delivered way before sales start or if final units will be like that as well. The retail box definitely doesn't suggest that the Gazepad Pro is not a finished product, since it comes with a precisely sized plastic holding tray and a nice picture print on the box. You also get a 90-degree USB Type-A to Type-C cable in the box, which we wouldn't necessarily call top quality. You might be better off using one of your own. Despite the minor imperfections the Gazepad Pro does not feel like a cheap product. On the contrary. The Gazepad Pro is very well made, looks and feels premium. The body itself feels really rigid and sturdy. It's a solid flat piece, no rolling or flapping around. This does make it quite inconvenient to carry around. On the flip side, it arguably works better as a mouse tracking surface. 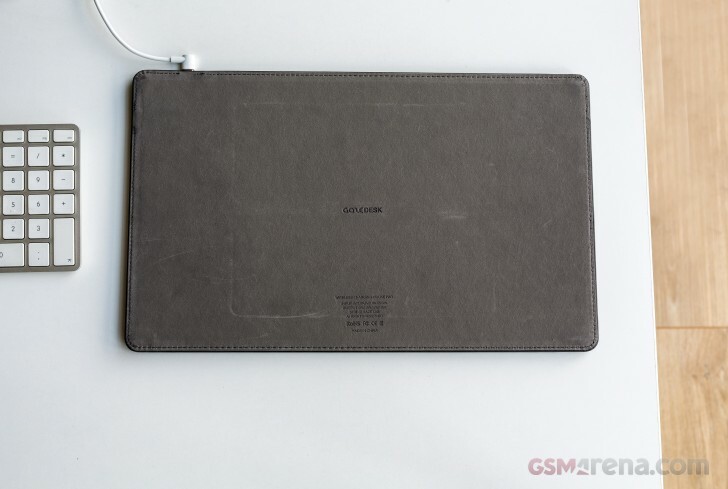 Speaking of surface, the top of the Gazepad Pro is covered with a PU material that gives a very convincing impression of leather. It even smells that way. Honestly, if the product specifications hadn't given it away, we would have simply deemed it leather. 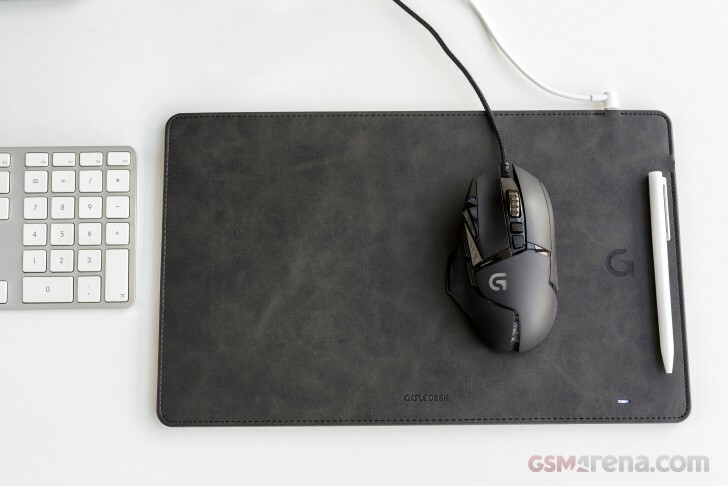 Despite its leathery appearance, the surface is really smooth and perfect for gliding a mouse on. It does not stick or sweat you palms, which would have probably happened with real leather finish. We can't exactly speak for longevity quite yet, but the material does handle scratches pretty well. Most small ones don't stick and disappear in the slightly elastic surface. There are four color options available. The blue even seems bold enough to fit with a more modern gamer PC desk look. The pad is fairly thick, measuring about 8mm. 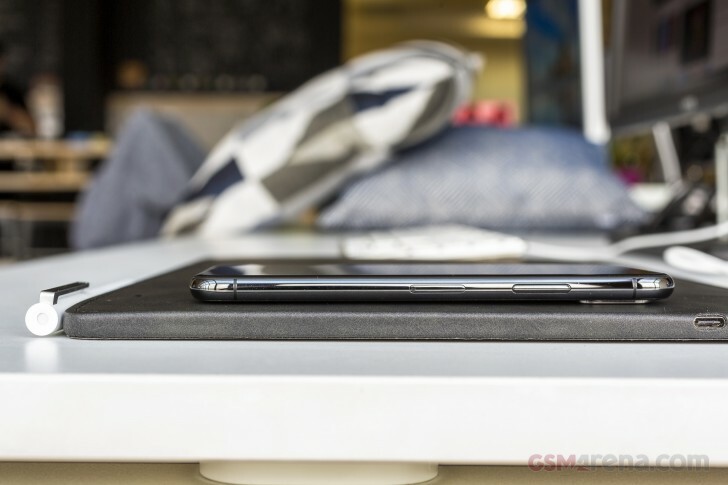 That is about as thick as a modern smartphone. This should be taken into consideration before you order one since it can be somewhat inconvenient to have two different heights across your desk. Thankfully, we found the Gazepad Pro big enough at 360mm x 220mm to accommodate our hand sitting a bit further away from the edge, making its height a non-issue. Bear in mind that thing can get a bit less spacious when you place your phone on the pad to charge. Any pro FPS players out there should probably look elsewhere for those low DPI aim flings or you definitely risk knocking your phone to the ground. 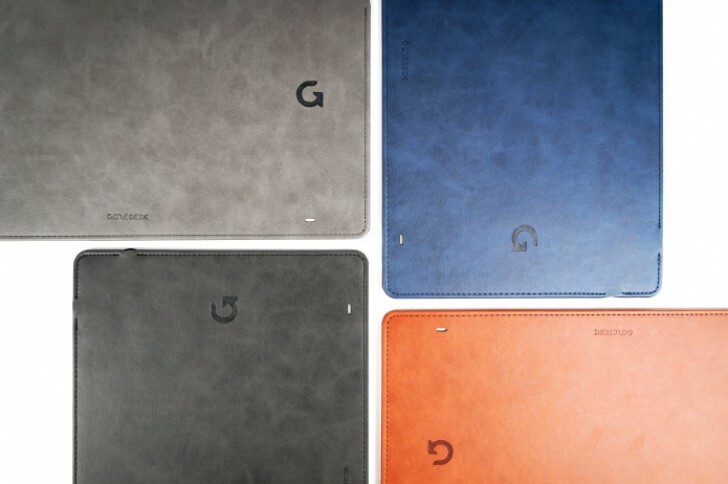 The underside of the Gazepad Pro is made from a different material. 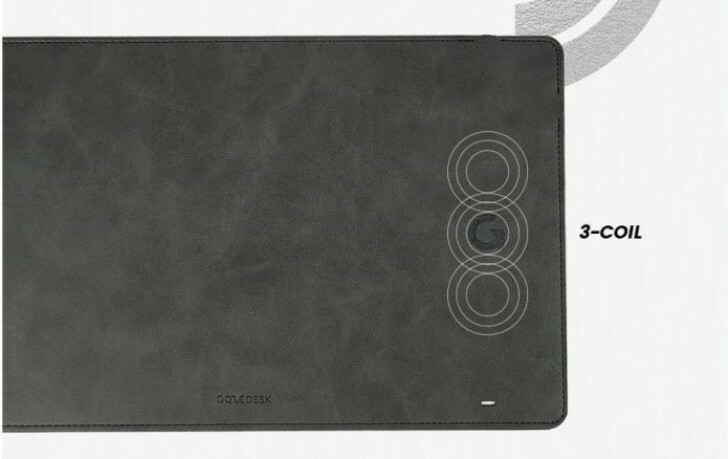 One that feels a bit like felt, It is still very soft and pleasant to the touch, but unlike the top side, it is very skid-resistant and grippy. No complaints there. Overall the construction is solid and of very high quality. Still, there is the odd detail here and there that could use some extra work. Like the stitching, the glue work and some of the stenciling. As far as the wireless Qi charging functionality is concerned, there are only a couple of external signs it is even there. 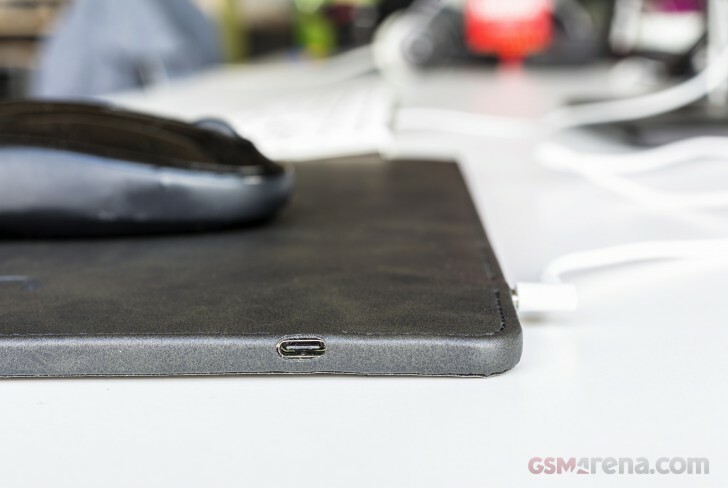 First, the pair of USB Type-C ports, situated on either side of the top right corner of the Gazepad Pro. The right one obviously works better with an angled cable, like the one in the box. The top one gives you a lot more freedom to just stick a regular straight one. As per the manual, never use both ports at once. Apparently they are wired in such a way that could cause a shot and even a fire. While the latter warning might be a bit exaggerated, we have little doubt that you can kill the charger this way. Gaze Lab should probably address this in a future revision. 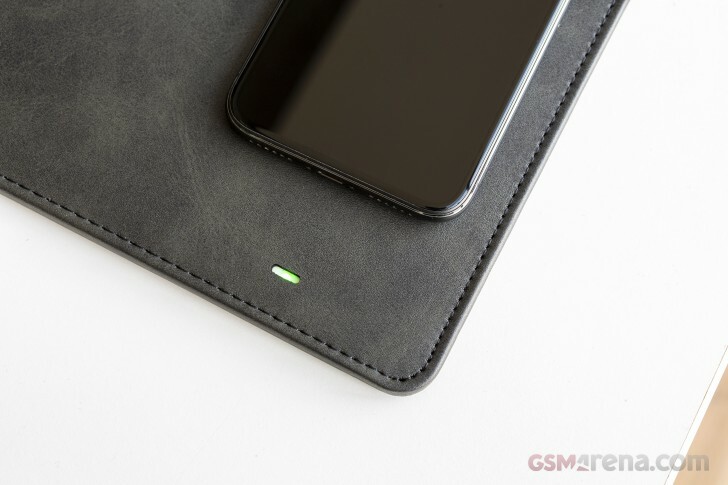 The only other sight of the Qi wireless charger is the small LED near the bottom right corner. It looks quite unobtrusive and does its status indication job perfectly since Gaze Lab went for one RGB unit, placed behind a diffuser of some sorts, which makes for a more subdued light. 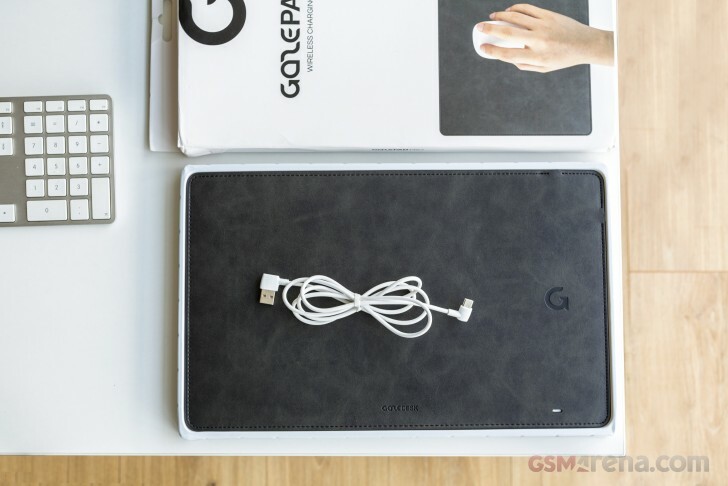 The Gazepad Pro sure looks great, but in order to justify that $60 ($40 on the Indiegogo marketplace) price tag and an extra cable, dangling around on your desk, it has to deliver adequate charging performance as well. Let's start with the advertised three-coil charging arrangement. In case you were wondering, having more coils does not increase charging speed, but rather expands the sweet spot for charging space. And we really have no complaints about the Gazepad Pro when it comes to that. Every phone we tried (Samsung Galaxy S9, S9+, Note9, Huawei Mate 20 Pro, Google Pixel 3 and Razer Phone 2) started charging just fine placed pretty much anywhere along the vertical axis. 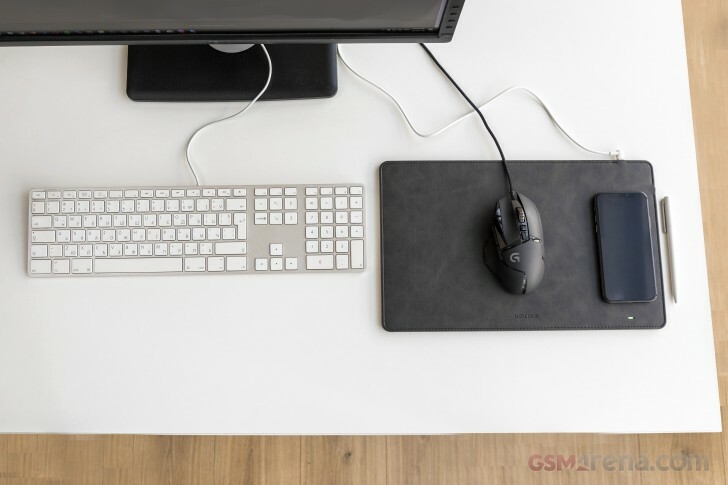 You will also be fine if you decide to place the handset to the far right corner of the mat and free up more space for your mouse, but the wiggle room to the left is still very much limited. The second and arguable more important part we tested is charging speed. Now, this is where things get a little bit tricky since there is no really accurate method of measuring wireless charging current. We have a wide selection of power meters in the office to measure all sorts of conventional charging standards, including implementations like Super VOOC or Quick Charge, but all these are useless when it comes to Qi charging. Initial instincts naturally suggest that we simply measure the current going into the charger with one of said meters, but that would give us an incorrect and skewed metric, as it's the output that really matters when you are using it. Our best bet was an Android app called Ampere, which we have resorted to on occasion in the past. It offers a live readout of the current going in the phone, minus the unit's current usage, as reported on an OS level. Far from perfect, but it's all we have. The manual recommends Quick Charge 2.0 input at minimum, which lines up well with the unit's input rating, as stenciled on the back: 5V/2.0A, 9V/1.8A, 12V/2.0A. What about USB Power Delivery, though? Connecting a 15W PD brick to the Gazepad Pro didn't power up the charger at all. Thankfully nothing broke or caught fire, but PD is clearly a no go. So, we went with a Quick Charge 3 brick for the actual testing. Thankfully, we also have a reference to go by and compare our numbers, provided by Gazepad. Starting with a pair of Samsung devices - the S9+ and Note9, with sufficiently depleted batteries, we expected to get the advertised 10W charging. Mind you that 10W is not actually a Qi standard - 5W and 15W are. Yet many phones are capped at 10W from their manufacturers. Unfortunately, charging peaked at 5W. Again, we remind you that these readings are reported by the phones themselves and in order to get as close as possible to the actual current that is going inside the phone, you have to subtract the current used by phone to work. For the Galaxy S9 and Note9 that turned out to be an average of just around 240 mA, so the math still works out to 5V@1A or 5W Qi. Next we grabbed an LG G7 ThinQ. As per the above charging speed list, the Gazepad Pro should be able to stuff a whopping 15W inside it. Granted, the current was noticeably bigger than what we managed to get on the Galaxy devices, but nowhere near 15W. A bit closer to 10W, but not even hitting that mark. Then it was the Huawei Mate 20 Pro's turn. 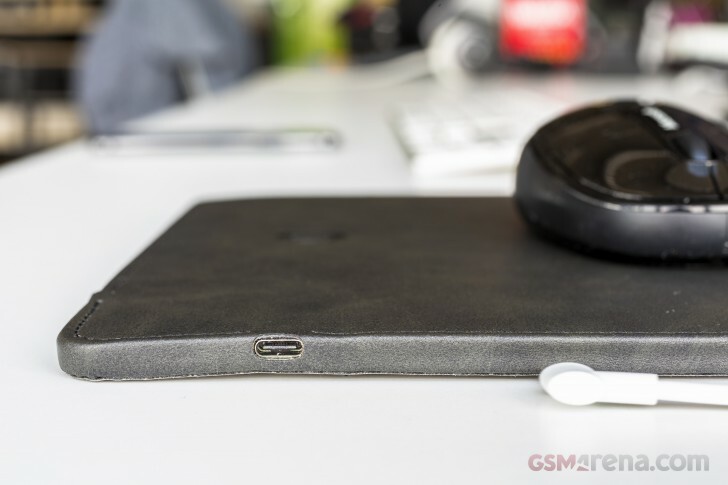 It also officially supports wireless charging at up to 15W via Qi, although it was not on the Gaze lab's list. No luck on the Huawei either, as it too capped at 5W. Finally, we grabbed the Razer Phone 2 and its fancy RGB charging dock, since we've already confirmed that combination can spit out 10W via Qi. What that told us is that the Razer Phone 2 is capable of getting 10W via Qi and that Ampere reports that correctly. Yet the Gazepad Pro could only pump just above 5W, - nowhere close to the official wireless charger. Even though we followed Gazepad's power input instructions very carefully, we very rarely managed to get it to supply more than 5W to a phone. To be fair, in its current state Qi is kind of a mess with various manufacturers going out of their way to implement things in their own proprietary way. It is not an isolated issue. 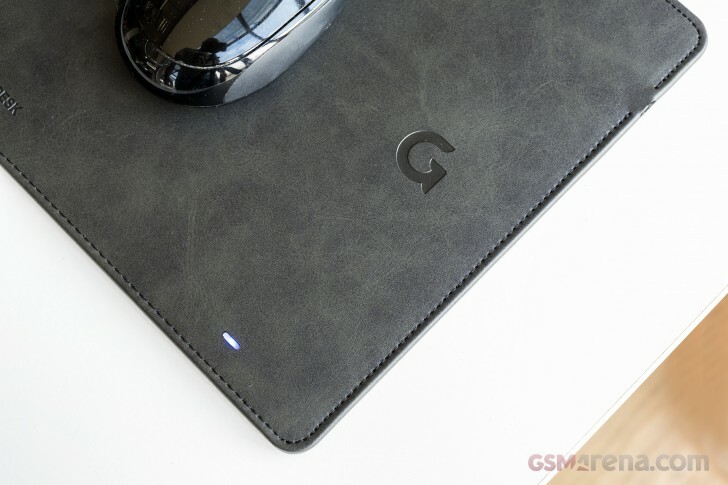 Take for instance the recent Google Pixel 3 fiasco, which revealed that only the Pixel Dock was capable of delivering 10W of Qi charging to the Pixel 3 and Pixel 3 XL. Any other charger simply capped out at 5W since that is what the phone could negotiate with it. 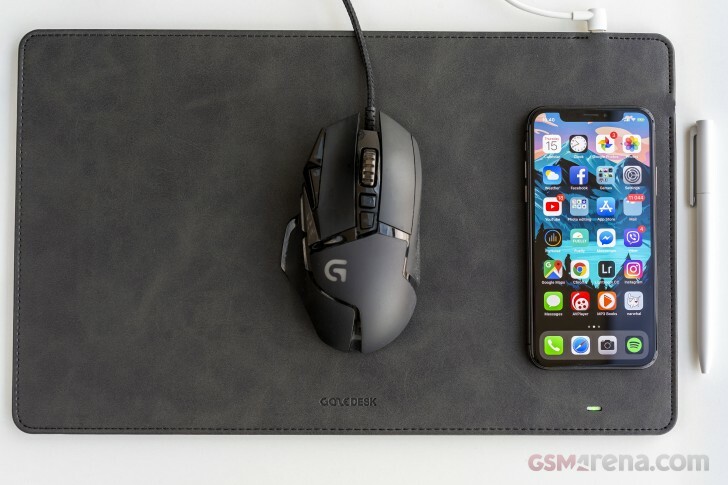 While cross-testing with various chargers and phones around the office for this review, we also noticed that placing a recent Samsung Galaxy, like the S9+ on the Razer wireless charger did result in charging speeds above 5W, but never the full 10W the Razer Phone 2 managed to pull. Our point here being that Gaze Lab may not be the only ones to blame here, even if they certainly make promises they can't fulfill. The Gazepad Pro is clearly a niche product and as such its usefulness is greatly dependent on your usage patterns. It's one of those little additions to your desk that could end up being completely useless for your or they can drastically improve your setup and simplify your daily routine. As far as simplicity and looks go, we have absolutely no trouble recommending the Gazepad Pro. Even at the pre-release stage we saw it, its looks and feel are really premium. It can easily tie together a clean desktop setup, while also providing a useful feature without a dedicated charger taking up extra space.